Ideally situated on the white sandy beach of Isla Cancun - between Nichupte Lagoon and the Caribbean Sea. 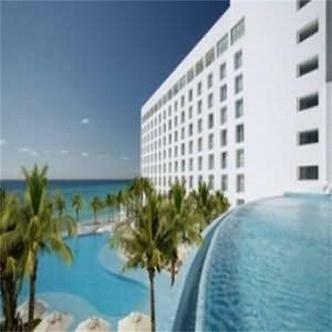 Walking distance to major malls.. restaurants.. nightclubs and the Cancun convention center. Only 25 minutes from the airport and 15 minutes from downtown Cancun. The hotels all-inclusive program offers guests all meals - Haute Cuisine.. snacks.. unlimited premium drinks.. as well as a variety of activities and entertainment for one price. 24 hour room service.. three ourdoor swimming pools including 2 infinity pools.. one overlooking the caribbean sea and the other the Nichupte Lagoon. Complimentary ... outdoor parking... 1 outdoor jacuzzi.. 2 swimup bars. Selection of unlimited tours are included as part of the all-inclusive amenities. Please be advised that due to the closing of Club Tulum for renovations - as of May 14 2007 we are no longer providing the Tulum - Paradise tour that was offered as a part of the selection of unlimited tours.Promotions: Swim with the Dolphins is free for one person when purchasing an "Ultimate Dolphin Swim Experience tour", per room, per Transportation is provided to the marinas. Non-transferable.Allure Package is per room, per stay and includes: two 25 min. massages, special petit fours in room and two polo shirts.Two-25 minute massages are valid for -Back Massage and available only in a single spa suite.Massages are non-transferable.Two adults per room only.LE BLANC EXPERIENCE PACKAGE: Swim with the Dolphins for two guests and once per stay, transportation to the marinas and two - 50 minute massages - Holistic massage valid only in a single spa suite. Non-transferable. It cannot be redeemed for cash if unused.